A user-friendly automatic regulation system for all types of sprayer. 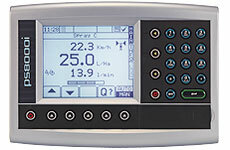 The RDS PSi Delta 34i is a user-friendly, fast-responding automatic regulation system for all types of sprayer. Faster and more accurate spraying, significantly reducing chemical costs. Compatible with RDS secondary software to provide one instrument that can be used for a wide variety of agricultural applications. Can be used for flow and/ or pressure based regulation. Fast-responding automatic control of spray output. Simple optimisation of nozzle selection and nozzle calibration. Manual/ automatic or variable rate application.